Prices in Dizin | Snowboard and ski in Dizin, Iran! Taxi from Tehran to Dizin: 300 000 rials. Minibus w/return: 100 000 rials. Ski-pass: Between 120 000 to 150 000 rials. Dizin Hotel: 410 000 rials during the week and 540 000 rials during the weekend. For a double. Snowboard rental: 250 000 to 300 000 rials per day at the shops around Dizin Hotel. If you go up to the top before the parking area you can find a snowboard for 100 000 rials. Includes boots. Please note that inflation is crazy in Iran, up to as much as 20%. These prices are as of February 2008. At that time 10 000 rials was roughly 1 dollars. Make sure you check the current currency rate. Tagged with accommodation, gear, price, rent, ski-pass, taxi, transport. Thanks for the Website. It’s nice. I am Iranian and I know that 10 000 rials is around 1 dollar (not 10 dollars). In fact we usually use Tooman in Iran (which is equal to 10 rials). so 10 000 toomans is around 10 dollars but 10 000 rials is 1 dollar. However, all prices you have written above are in rials. Off course, my mistake! I have changed it so 10 000 rials correctly converts to 1 dollar instead of 10 dollars. I think it is best to quote in rials as the rials/tomans can be confusing for first time tourists. However I should mention this. hope to see you again in Iran! Hi – nice info/site. About snowboard rental – you mentioned a cheaper alternative at 100,000 rial “at the top before the parking area”. Just curious if that means the parking lot at the BASE or is there a parking lot at the TOP of the ski area? Also – is this area open in June? I’ll be in Iran May/June & would love a snowboarding outing then! If open, how cold does it get? Jngah: It is just before the parking at the top of the ski area. It is where the road to Tehran ends. Not sure how the conditions or the weather is in June. But if it is possible to ski just remember that it is at 3700m so it can be cold. Great site, with a ton of intell. The prices for the accommodation, is 410 000 rials per person and night? Is there any alternatives? I´ve read something about chalets but I reckon that they are a bit more expensive? One last question; Food! Is it easy to go and cook your own food or do you depend on restaurangs? Very good information. I am interested to visit Iran with my family. I am from Tropical country who want some snow experience. Is this Dizin a good place to visit with family in December? How cold is that? Like Pontus, I’d also like to know more about the chalets. Is there a point of contact…? 4 of us are heading out to Dizin from Dubai at the end of Jan 2010 for snowboarding. Pontus: 410 000 rials is for a double. There is a few cafes during the daytime, one at the top and on in the middle of the slope. And there are two restaurants at the hotels. Alternatively you can walk down to the village to buy groceries. Dony: Well the temperature at the moment is about -10C. Check http://www.yr.no/place/Iran/Teheran/Dīzīn/ We have a saying here in Norway; ‘there is no such things as bad weather, just bad clothes’. I do not know the prices for chalets but you can check with the hotel. You can find the contact details on this site. Thanks for the information! You mention there is snowboard hire at the resort. Is there ski hire, too? Seasky: Yes, you can hire skis as well. Whats the policy on alcohol? Is Sharia law enforced in the resorts? Could I get stoned to death by getting jiggy outside marriage? Or am I way off the mark? spanky: Alcohol is forbidden in Iran as is any form of relationship between genders outside the family. I would recommend not to take any chances in regards to getting jiggy with it. Having said that Dizin and north Tehran are quite liberal places, but public and private life is quite separated. Life for the young and liberal the mid/upper class in north Tehran is not much different from Europe/US in many ways. Doing something illegal could result in jail or they might just throw you out of the country since you are a foreigner. Either way, breaking the law is not encouraged. Have a look at http://freethehikers.org/ to see what I mean. But if you follow the rules and comply with the culture in the country you will have a great time. Iranians are very friendly and that was also my experience with the little relations I had with the government; I extended my visa twice as I loved it so much there – they served me Gaz and provided a speedy approval of my application. Hey Espen, drop me a line please! Excellent information on Dizin. I’m fairly flexible on dates, when do you think is the best time to visit? Also, should I book all through a travel agent in advance or is it equally easy to arrange everything once you’re on the ground? We was there last week, it was fantastic trip even for family. The information here is very helpful. What’s the standard of the ski gear that’s available for rent? I’m planning a trip to Dizin in Feb and I would like to travel light and just take my boots. Can you rely upon getting decent equipment for an advanced skier? just checking, what are the prices for the chalets and good skiing gear? Nick: No ski park but you can easily go off piste and probably find decent jumps. Thomas: You will find some good equipment at the hotel, maybe 300 000 pr day. You will also find some gear for rent at small shops at the parkering lot at the bottom and on the top (cheapest; 100 000), which is a lot cheaper than the hotel, but not the same standard. How do you manage to book a double for 410 000 rials? The phone line to the hotel is very bad and I am unable to make a booking or find out anything about the room options. The cheapest Tehran based tour company that I have found is quoting $85+17%tax even thought they swear that this is the hotel price without any markup. Many of them like to quote more in euros. I am also going on the 12th. How much are the chalets? also how long would you recomand skiing, as in before you get bored? 7 days? 4 days ? Nick: there are some chalets there but not sure about the prices. If you are more than 2 people I would assume it would be better and cheaper to get a chalet though. If skiing makes you bored I would suggest not to stay for too long. But if you love skiing Dizin has plenty of that. Other than that there is not really not much to do there except eat and enjoy the fresh air. Mmmm…sounds good, I must go there again soon! I managed to find the dizin website dizinpad.com and it says that they have a half pipe. Looks like they have made and are planning many improvements. The cabins are about $250. I am going toomorrow (fingers crossed) so I will be able to confirm many prices etc. No I am not iranian which would have made things much easier regarding booking, but hopefully things will go well and I will report back soon. I’m back. I ran out of money so I had to come back a day early. Don’t ask me why two 5 beds are cheaper than one 10 bed. I come accross this sort of thing all of the time in the middle east. Equipment rental hasn’t changed, except it got up to 750,000 rials per day during the long weekend before we got there. The top road is shut because dizin and shemshak can’t decide on who should snow plow it, so the only rental is down the bottom. 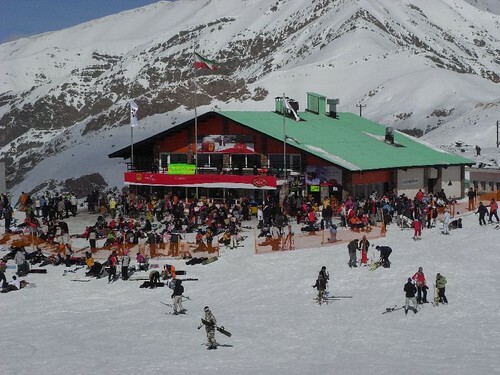 Ski rental is 200,000 rials per day for adults and 150,000 for children. Instructors charge up to 250,000 rials per hour or 1,000,000 per day. I didn’t go to the snowboard park, but very few people were using this side of the mountain and I am not even sure if the chairlifts to the park were operating (at least they weren’t when I was in that area). Thanks for this great website. We are going to Dizin tomorrow and all the comments have been so useful in organising our trip! HI, does any 1 know when the ski season there starts? like can we go there late november or early december for some good skiing? Could you give some information about accomodation prices in Dizin ? I have some plans to get there in January !!!! I`ve seen it !!! Only 2 questions – 1. will prices be the same in 2010\2011 ? 2. double 700.000 – is it price by one person ? or by two ? All prices are per room. I found cheapest tickets for the period of 3.01-11.01 by ArmAvia 🙂 (with connection in Erevan) with arrival to Tehran at 01.15am 4.01.2010. Maybe you will be interested to share transfer if we concure in the dates of the trip. I’m a Dane going to Dizin from the 22nd to the 28th of December. I’ll post any info I have on prices, hotel reservation etc. here, as I go along. I finally got through on the phone to Dizin 1 and booked a double room (since they don’t have any single bedrooms). They said they’ll charge me $80 per night for it. It’s not enough to make ponies cry, but it’s not exactly OMG!-cheap either. Thanks for the great site- I am traveling to Dizin in February with an Iranian family that has nothing but great things to say about the skiing and experience there. I will check out the hotels noted here in this blog. The links for the currency translation are really helpful! Hi everybody. I’m half-English, half-Iranian with basic farsi speaking skills. I plan to travel to Dizin or Shemshak from around 7th March onwards (I have not booked my flights yet). I’m just back from my trip to Dizin. There wasn’t any room left at Dizin Hotel 1, so they put me in Dizin 2. It seems to be run by the same people anyway. The hotel was fine even though the restaurants weren’t open. I was told that they would charge me USD 87 per night, but when I met the hotel manager he told me pretty much out of the blue that I would get a 20 per cent discount, so I ended up paying USD 67 per night. Holger: Thanks for the update. Wow, the price has really increased a lot. Судя по Вашему комментарию (Мартину) Вы уже побывали в Дизине? Если “да”, то может поделитесь информацией!?. Мы собираемся в конце февраля дней на 10 туда слетать, но не знаем как это организовать. В целом проблем никаких нет. Напишите мне в личку, я дам контакты дешевого трансфера. Напишите напрямую в отель в Дизине, можно ли без оплаты забронировать места. Мы в gajereh жили и кроме нас почти никого не было.